This maxi travel board is just over 11" long and 2 1/2" wide. It comes with six full-sized metal pegs. 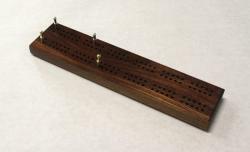 The pegs live inside a pocket in the back of the board, held securely by a sliding brass plate.